concrete supports for a turbine. 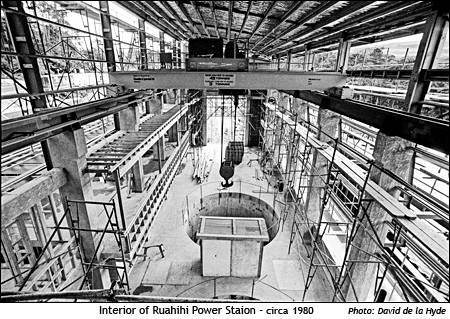 Work on the Ruahihi project started late 1977. 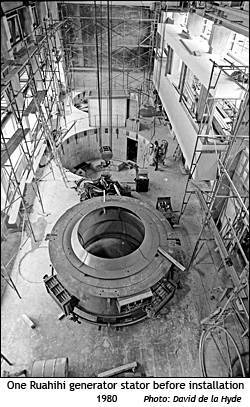 It was commissioned in May, 1981. Its reservoir is Lake McLaren, alterations to the original dam and spillway being made to raise the lake by 1.2 metres. A canal 3,500 metres in length leads to a concrete forebay and 600 metres of twin concrete penstocks and 150 metres of steel penstocks 2.3 metres in diameter take the water to two 10,000kW vertical Francis Turbines. The canal involved extensive earthworks with some cuts being up to a maximum depth of 34 metres. Ruahihi Station discharges its water into the upper tidal limit of the Wairoa River. 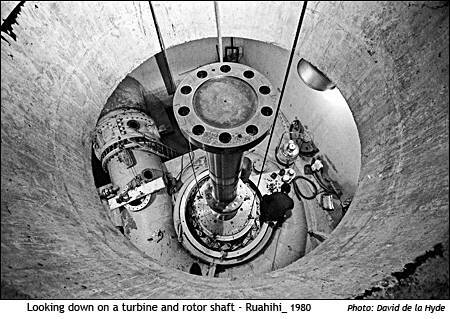 The generating head is approximately 88 metres and the annual output is approximately 70,000,000 kWh per year. Total cost of this project was approximately $27,000,000. 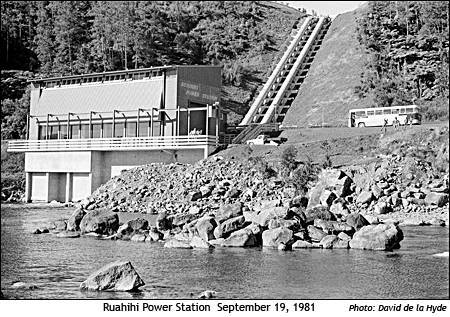 Because Ruahihi generates over three times as much energy from the same water as McLaren Falls Station the latter was scheduled to effectively ceased generating in June, 1980. 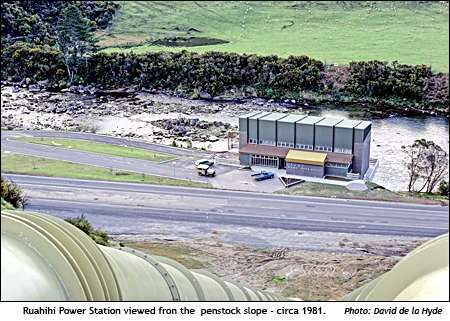 The Omanawa Falls Station still continues on a reduced output of approximately 170kW.